This Pinup Photo was added on Wednesday 09 January, 2019. "Enlist in the US Army!" 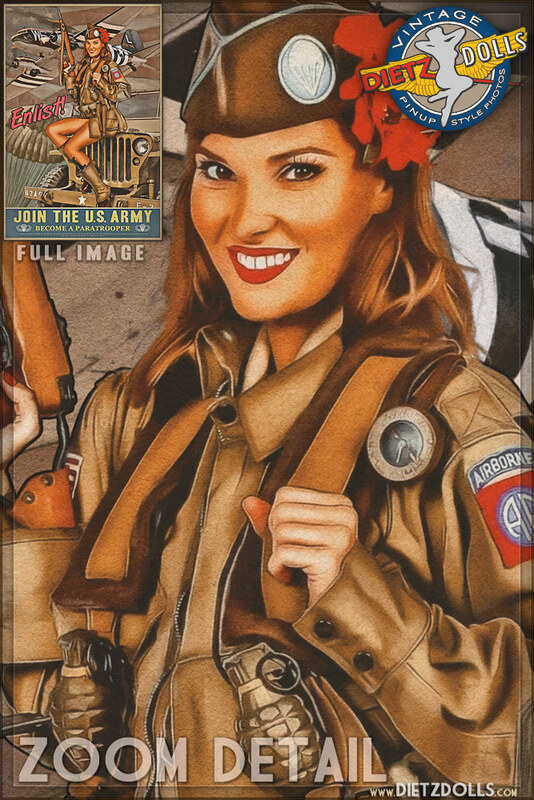 A sequel to the Enlist in the 82nd Airborne Propaganda Pinup Poster, Kelsey is back with another call to enlist in the US Army! The 82nd Airborne, along with the 101st and many other Airborne groups from many different countries played a pivotal role in paving the way during D-Day (June 6, 1944). Thousands of US Army paratroopers found themselves deep behind enemy lines as they were dropped the morning of the invasion, and as they gained more and more land they eventually linked up with the forces from the Normandy beachhead securing the way to the Nazi defeat. 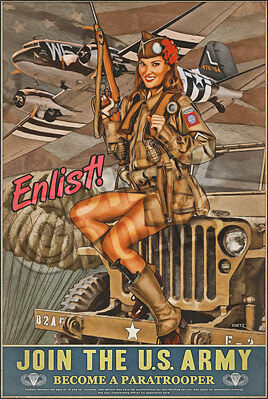 Kelsey is sitting atop a Willys Jeep with a Douglas C-47 Skytrain, used to drop paratroopers into Europe, behind her.